Matthew Apgar - mapgar@shawmedia.com Attendees at the Crystal Lake Lions Club's 17th annual winter steak fry follow down the line, filling their plates with food on Saturday, Feb. 6, 2016 at D'Andrea Banquets and Conference Center in Crystal Lake. 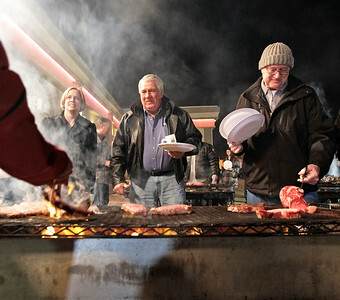 Matthew Apgar - mapgar@shawmedia.com From left: Lesley Calderone, Glen Jensen, both of Crystal Lake, and Carl Stengele of Fox River Grove tend to their steaks during the Crystal Lake Lions Club's 17th annual winter steak fry on Saturday, Feb. 6, 2016 at D'Andrea Banquets and Conference Center in Crystal Lake. 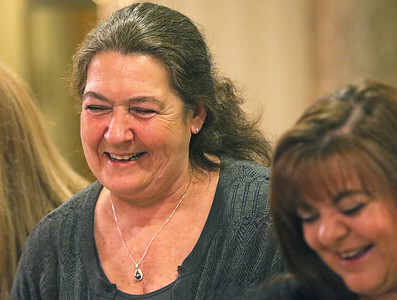 Matthew Apgar - mapgar@shawmedia.com Antoinette Sarno of Cary, left, and Donna Clarke of Crystal Lake share in a laugh as they follow down the line for food at the Crystal Lake Lions Club's 17th annual winter steak fry on Saturday, Feb. 6, 2016 at D'Andrea Banquets and Conference Center in Crystal Lake. 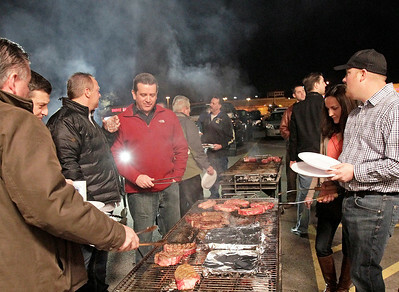 Matthew Apgar - mapgar@shawmedia.com From left: Karen Morrison of Lake In The Hills, Kar Covey, Chris Covey, both of Crystal Lake, and Carl Stengele of Fox River Grove tend to their steaks outside on the grill during the Crystal Lake Lions Club's 17th annual winter steak fry on Saturday, Feb. 6, 2016 at D'Andrea Banquets and Conference Center in Crystal Lake. 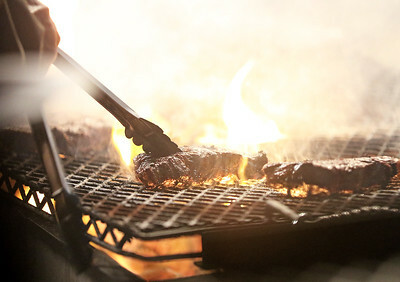 Matthew Apgar - mapgar@shawmedia.com A steak cooks on the grill during the Crystal Lake Lions Club's 17th annual winter steak fry on Saturday, Feb. 6, 2016 at D'Andrea Banquets and Conference Center in Crystal Lake. 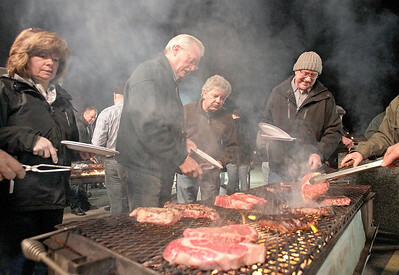 Matthew Apgar - mapgar@shawmedia.com Attendees at the Crystal Lake Lions Club's 17th annual winter steak fry tend to their steaks on Saturday, Feb. 6, 2016 at D'Andrea Banquets and Conference Center in Crystal Lake. 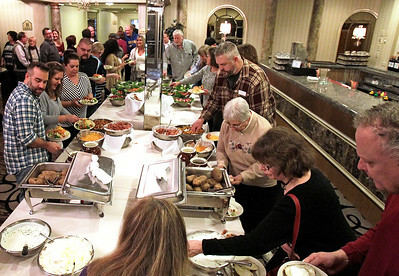 Attendees at the Crystal Lake Lions Club's 17th annual winter steak fry follow down the line, filling their plates with food on Saturday, Feb. 6, 2016 at D'Andrea Banquets and Conference Center in Crystal Lake.